Taylor Swift joined Ryan Seacrest at Monroe Carell Jr. Children's Hospital at Vanderbilt last week to open the 10th Ryan Seacrest Foundation Seacrest Studio. 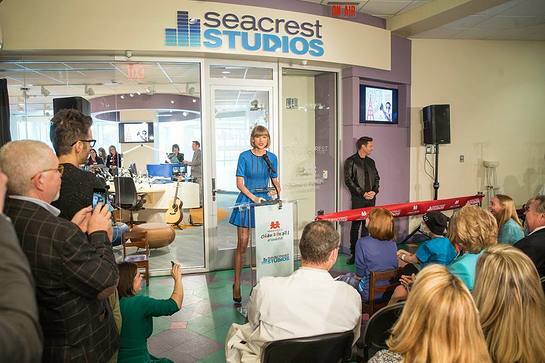 Three patients joined the Ryan Seacrest Foundation, Ryan Seacrest and Taylor Swift for the ribbon cutting. The Seacrest Studio is a partnership between Vanderbilt and Ryan Seacrest Foundation, which has been building broadcast media centers in pediatric hospitals across the country since 2010. The studio enables patients to explore the creative realms of radio, television, and new media right from their hospital rooms. RSF’s mission is to help sick and injured children heal by providing access to multimedia experiences that brings patients exciting, stimulating adventures which encourage optimistic thoughts during treatment.